An estimated 24,131,000 passengers will travel by rail during the chunyun period in Zhejiang Province, an 8.8 percent increase over last year. Their services are really good. People here are warm-hearted,” 57-year-old cleaner Wang Xinhua said. Wang was getting a free haircut, offered by a group of volunteers, in the waiting hall of Hangzhou East Railway Station, before he took a train back to his hometown in Guilin, Guangxi Zhuang Autonomous Region, at 8pm. “I have not been home for six years,” Wang said. Wang is one of the many migrant workers living alone in the city. Spring Festival is usually the only time they can get together with their families. Gu Yajuan (left) helps out with the luggage of a passenger at Hangzhou East Railway Station during the chunyun travel rush. 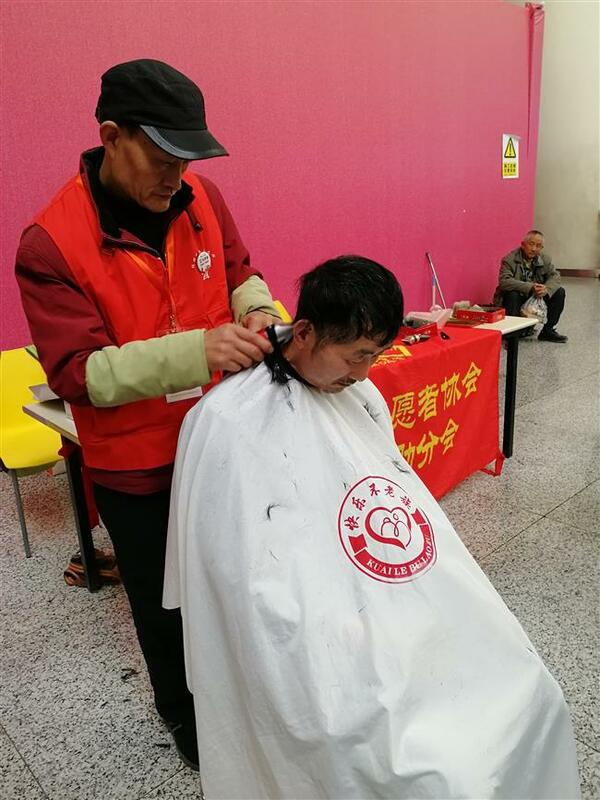 Wang Xinhua gets a free haircut at Hangzhou East Railway Station before he hops on a train back to his hometown. 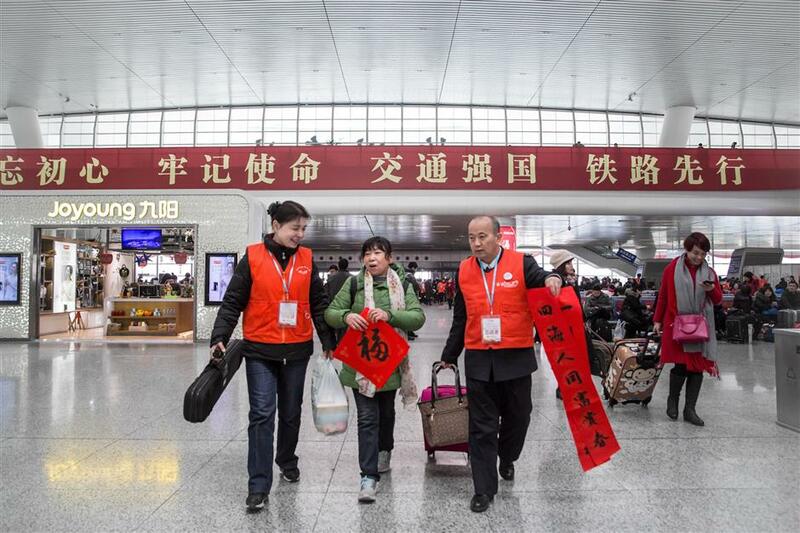 From January 21, chunyun, the Spring Festival travel season, also known as “the largest annual human migration in the world,” is taking place in all of Hangzhou’s transport terminals, but mostly the railway stations. The government estimates there will be 24 million people traveling by train during the chunyun period in Zhejiang, a rise by 8.8 percent over last year. As the supervisor of volunteers at Hangzhou East Railway Station during the travel rush, Gu Yajuan is a witness to the social development and changes over the years experienced by those going home. “The first generation of migration workers usually carried a pole on their shoulders, loaded with local specialties for their families. Since 2013 and 2014, the second generation workers have appeared, no more carrying poles or painters’ buckets, but trolley cases,” said Gu. Gu’s volunteering experience at railway stations dates back to 2008, when a rare snow storm hit the city just before Chinese New Year. Trains were canceled. But it did not prevent people coming from all directions. Hundreds of thousands of them were stranded at Hangzhou Railway Station. Shelters were built to accommodate those staying in the square outside. “We comforted passengers, distributed free hot water, instant noodles and steamed buns, and also relocated some of them to hotels and auditoriums nearby since the station had no more room,” Gu recalled. At first there were only 20 volunteers, then more people joined in. Even some of the passengers decided to stay and help out. Gu still remembers the two hotline numbers used to recruit new volunteers. She had to carry a cordless phone with her to handle incoming calls at any time. After working tirelessly for eight full days, Gu caught a serious cold and lost her voice. When all the work ended, she had to recover at home for two weeks. Gu said it was the appreciation from passengers and also devotedness of fellow volunteers that encouraged her to keep doing it over the years. 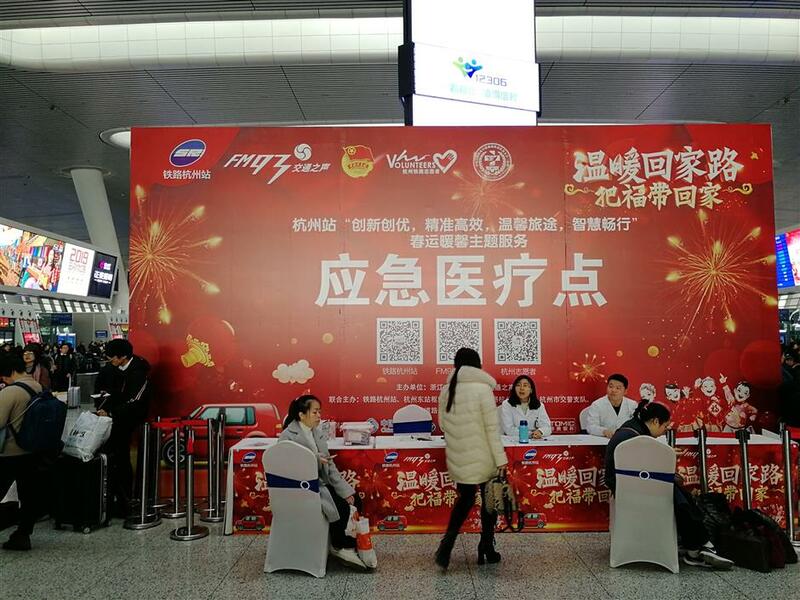 Since 2008, volunteer services have been provided in a more organized way at railway stations in Hangzhou during the chunyun period. Calligraphers write and hand out free Spring Festival couplets and the character fu (good fortune) to passengers to bring good luck. 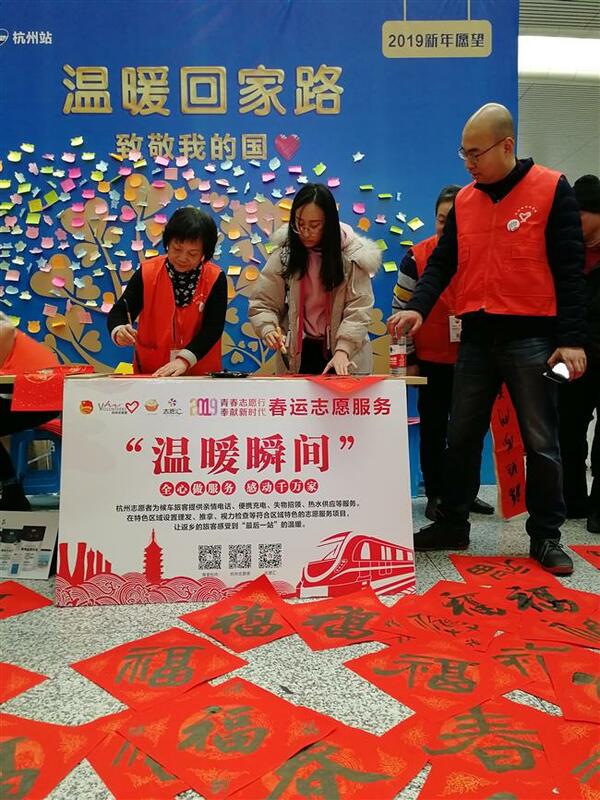 This year, before New Year’s Eve, there are about 300 volunteers working every day at Hangzhou East Railway Station and more than 100 at Hangzhou Railway Station. Most are young people, college students or office workers who may have just graduated a few years ago. Seniors take up the work back stage, arranging meals and clean-up work. The volunteers are allocated everywhere in the station, at the four entrances leading to the waiting hall, beside the escalators, at security checks and in ticket offices. People familiar with train services and the station are assigned to the help desk. Gu told Shanghai Daily that, as the life of migrant workers was getting better, their volunteer services also needed to be upgraded. In 2013, a wishing wall was put up inside the station. Everyone who adds their wish notes on the wall gets a New Year’s scarf. There’s also a mobile bookstall dispensing free books to passengers and a zone where parents may leave their children under the temporary custody of volunteers. Free medical consultations or haircuts are provided for workers who may not be able to afford them. “You know a lot of them are construction workers, cleaners, milkmen and street vendors. These people serve us all year around. They deserve our respect and kindness,” said Gu. Her passion and compassion is an inspiration for the youngsters who also commit themselves to volunteering. Sun Jie, a 24-year-old graduate has been volunteering at Hangzhou East Railway Station since his first year at college. This year he is a team leader training new volunteers and oversees work at the six ticket offices in four different corners of the station. At 6:30am every day he leaves home and travels more than an hour from the western part of the city to the station. The step counter on his smartphone shows that he walks between 26,000 and 30,000 steps on average each day. In the station he will be stopped many times by passengers looking perplexed or worried. Many of the questions are the same — about directions and ticketing issues. To be a good volunteer, he has to keep watch on everything that’s going on. “If an elderly person lingers for a long time in front of a ticket machine, very probably he or she does not know how to operate it,” Sun said. 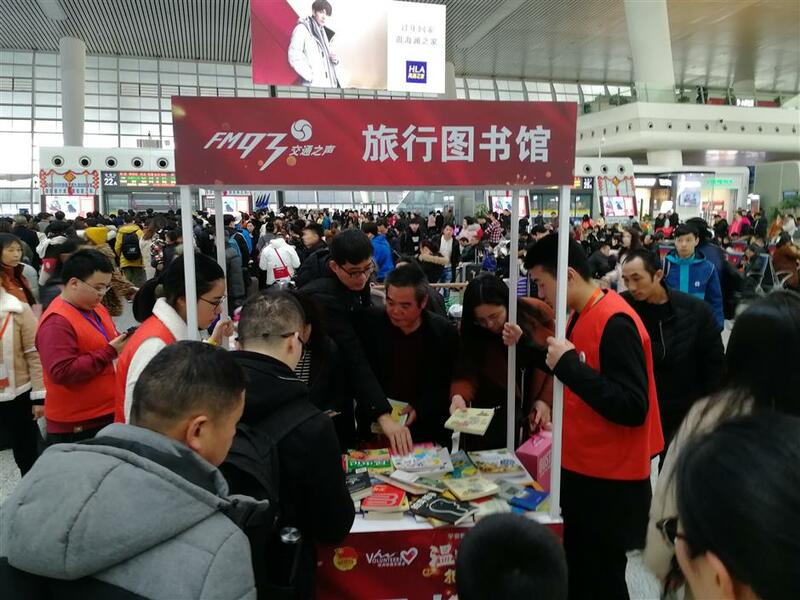 A mobile bookstall dispensing free books attracts many passengers at Hangzhou East Railway Station.